Saturday’s XTERRA Pan American Championship race is the last of 12 races on the 2018 XTERRA Pan American Tour and for both amateurs and elites, Tour titles are on the line. We broke down the elite title chase scenarios last week (read preview) and here we look at the battles brewing for the amateur tour titles. 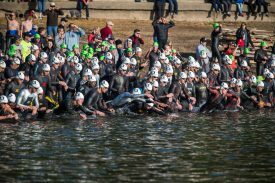 Four of the 24 age group divisions are already locked up. Sophie Allen (Female 15-19), Magdalena Mihura (Female 45-49), Ronaldo Ferreira (Men 30-34), and Michael Mazza (Male 50-54) have insurmountable leads and have already been declared the 2018 XTERRA Pan American Tour Champions. The other 20 age groups are up for grabs and will be settled on Saturday. Two of the biggest battles are in the women’s 25-29 and 35-39 age groups. In the 25-29 age group, Amanda Beyer (175 points) has a 10-point advantage over Heather Wilson (165 points). Beyer won her age group at XTERRA Oak Mountain and XTERRA Quebec while Wilson was second at XTERRA Oak Mountain and won XTERRA Victoria. As an interesting twist, Kat Marks’ performance in the race could either help or hurt Beyer and Wilson. Marks didn’t have a great race at XTERRA Oak Mountain, where she finished third behind those two. She was dealing with some health issues, which she has rebounded from, judging by her overall win at XTERRA Lory. How Marks fares in the Saturday’s race could help determine whether Wilson is able to vault over Beyer and capture the tour title. An exciting battle is also underway in the 35-39 age group between Sian Turner Crespo (175 points) and Kristen Wade (157 points). Crespo won XTERRA Oak Mountain and XTERRA Victoria. Wade was second to Crespo at XTERRA Oak Mountain and second at XTERRA Costa Rica. If Crespo can keep her lead in Saturday’s race, she will also keep her lead in the tour. The men’s 35-39 battle is as close as the women’s. Currently, Matthew Monnot is in the lead with 201 points from a 7thplace finish at XTERRA Mexico, 5thplace finishes at XTERRA Victoria and XTERRA Costa Rica, and an 11thplace finish at XTERRA Beaver Creek. Francisco Gonzalez is in second place with 175 points, but he was the first overall amateur at XTERRA Beaver Creek and won his age group at XTERRA Chile. If he wins on Saturday, Monnot will have to place fourth or better to keep the lead. In the men’s 40-44 age group, it’s another show-down as usual between these competitive athletes. The current Pan Am Tour leader – Mauro Alberto De Luca – has 198 points but isn’t on the start list. Garren Watkins is behind him with 182 points and is likely to pull ahead after Saturday’s race (he would just need to finish in the top 15). What makes his job a bit trickier is Michael Dorr (145 points), who beat Watkins by just two seconds at the XTERRA Pan Am Championship last year. One of the many hypothetical scenarios, and most interesting, would be if Dorr wins the age group again – which will garner him 100 points – and Watkins finishes 6th, they would each have 245 points. It would go to a tie-breaker, which goes the racer with the most wins. Which would also end in tie as each man would have one win. Then it goes to who finishes higher on the day, which would give it to Dorr. The 45-49 men’s age group is also competitive, but it’s likely that Aaron Sanchez Garcia (who is women’s elite tour leader Fabiola Corona’s husband) will be the 2018 XTERRA Pan Am Tour Champ. Sanchez was third at XTERRA Mexico and 6th at XTERRA Quebec, XTERRA Victoria, XTERRA Argentina, and XTERRA Chile for a total of 307 points. Eric Snowberg, who was second at XTERRA Beaver Creek and XTERRA Costa Rica and third at XTERRA Oak Mountain, has 239 points. With a win, Snowberg could put the pressure on Sanchez to finish 13th or better on Saturday, which is no easy task as all the ringers show up for this race. The race is tight in the 55-59 age group as well. Bruce Wilson is in the lead with 157 points, Tim Milton has 101 and Karl Edgerton has 100. With a 56-point gap, Wilson is likely to keep his lead, but Milton and Edgerton will not let him get away easily. All three athletes are well matched. Wilson was second at XTERRA Oak Mountain, Edgerton won XTERRA Beaver Creek while Milton was fourth at XTERRA Victoria. Similarly, in the women’s 30-34 age group, Amelia Van Dyke (190 points) will likely claim the XTERRA Pan Am Tour title but is going to be chased by Melanie Willard (142). Anne Pendygraft is in second place in the Tour standings with 167 points currently. She won’t be racing in Utah like Van Dyke and Willard, so she will probably move further down in the rankings. That said, racers can still sign-up for the race tomorrow. We could see some surprises. Of note, you must race in at least two events to be eligible for Tour titles. Find the rules here. In the women’s 20-24 age group, Abigail Bird, Averi Lewis, and Giovanna Opipari are tied at 100 points, but because only Bird is on the start list in Utah, she will probably win the XTERRA Pan Am Tour as well. A similar situation exists in the men’s 15-19 age group. Hegel Jesus Maldonado Custodio, Colin Szuch, Will Stacey, and Yan Oliveira are tied with 100 points while Benny Smith has 90. However, with Smith the only athlete competing at Utah, he will likely vault into the lead. In the 70-74 age group, John Picard is in the lead with 150 points, but Laurence Goddard is racing on Saturday and if he finishes higher than 8th place in his age group, he will move past Picard. Sometimes, these point gaps can be huge motivators to athletes, as in the case of the men’s 20-24 age group. Facundo Jaramillo is in the lead with 151 points and Edward Bird only has 63 points. However, if Bird takes second place in his age group in Saturday’s race, he can pass Jaramillo and move into the lead. In the women’s 40-44 age group, Deanna McCurdy will likely take the XTERRA Pan Am Tour title as will Margo Pitts in the 50-54 division. As we know, anything can happen in XTERRA, which is why the races are so exciting, but based on their leads and the fact that they are both undefeated, they are the frontrunners. In women’s 55-59, Elaine Morison is in the lead with 161 points and is followed by Sharon McDowell-Larsen (100 points) and Janet Soule with 90 points. All three will be racing in Utah, and while it’s likely that Morison will retain her lead, McDowell-Larsen and Soule are strong competitors and will do everything they can to close that gap. In the men’s 25-29 age group, Claudio Borquez will likely keep his lead in the Tour. He has 218 points and will race at the XTERRA Pan Am National Championship. Andrew Auer is also racing, but he only has 90 points and won’t be able to catch Borquez. In the men’s 60-64 age group, Cliff Millemann will probably keep his lead as will Dawes Wilson in the 65-69 age group. With race day just around the corner we expect the excitement to grow and the atmosphere to continue to buzz with anticipation of Saturday’s race, which will determine the 2018 XTERRA Pan Am Champions, and in many cases, who comes out on top in the XTERRA Pan Am Tour. We can’t wait to watch some of the best amateur off-roaders in the Americas settle it in Utah.